I received a reader renovation that I just had to share with you all. Erin is a fellow Wisconsinite, and sent me photos of a lovely 1929 bungalow that she renovated and recently sold in the Milwaukee area. 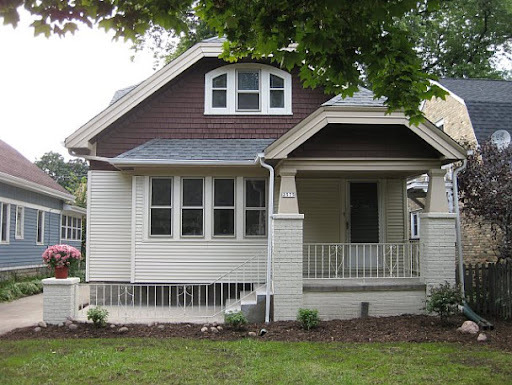 I have always admired the older homes in Milwaukee and the surrounding suburbs, so I was quite excited to see what she did. Here's a recap in her own words, and pictures of her whole-house renovation! The exterior of the house was in need of a face lift, but I didn't have the funds in the budget to do any major work. The house had been sitting empty when I bought it, so the lawn and flowerbeds were a mess. With the help of some $10/hour labor from Craigslist, the lawn was brought back, the flowerbeds completely cleaned out, and new topsoil, mulch and plantings bought in. The major changes came from painting the brick piers and the metal railing the same color as the window trim. Painting brick is a real PITA but the bang for the buck on this portion of the renovation was totally worth it. 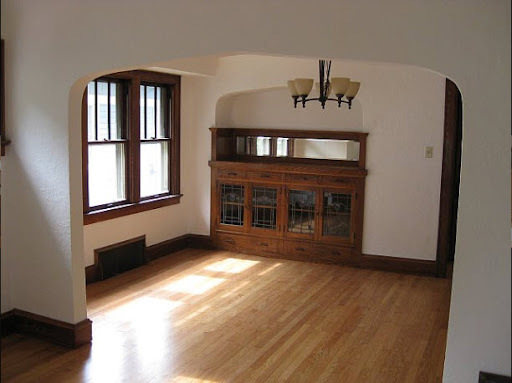 The floors were refinished, the built-ins and moldings were cleaned up, lighting was switched out. I love old houses. 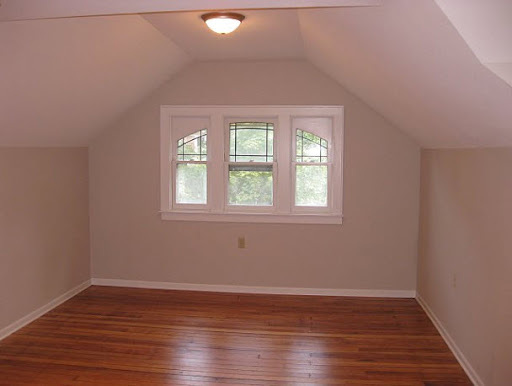 However, I don't love the tiny bedrooms or tiny closets that usually come with old houses. When I looked at this house I knew exactly what I was going to do with the 2nd floor. The previous owners had started the work, but there was still a lot to be done. 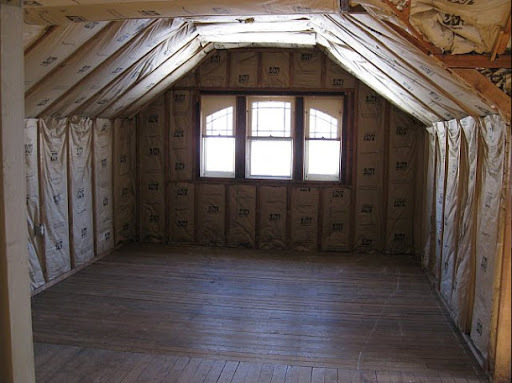 The front half of the 2nd floor wasn't drywalled. 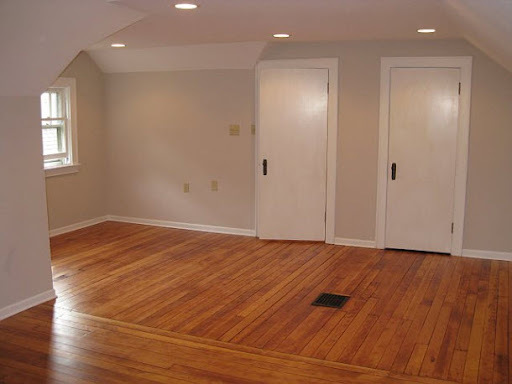 A back bedroom was small and lacking a functional closet. It was pretty clear to me that the way to go would be to make the entire 2nd floor a huge master suite. The stairway, hall and bedroom got drywall, paint, trim and new light fixtures throughout. My carpenter was able to almost exactly mimic the door and window trim on the first floor. The floors on the 2nd floor are only pine, but my floor refinisher convinced me he could stain and seal them. They're a little soft (dropping a tool left a nick) and the finish isn't as uniform as it is on the oak on the first floor, but I still prefer it to carpeting. 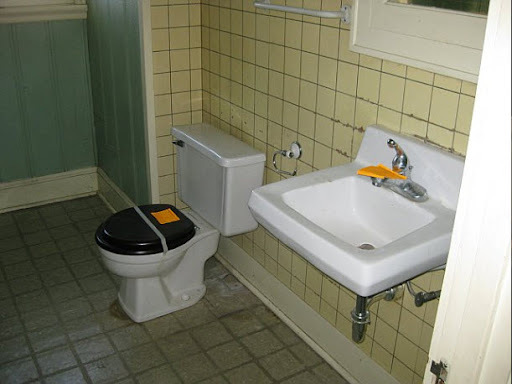 The gross 1950's 1/2 bathroom was pretty much intact. The walls were covered in 'beaverboard', kind of a cork-like material that had a finished face. 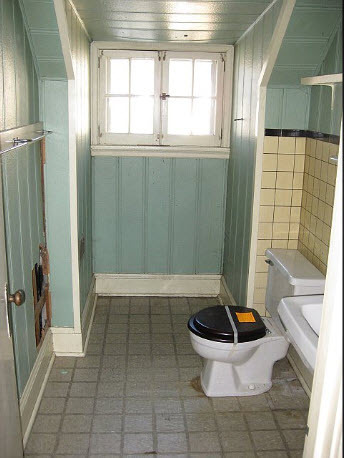 Continuing the work that the previous owners had started, the bathroom was given all new drywall, flooring, and fixtures. I love how it turned out for the most part. The vanity, granite top, sink, and floor tile all came from a local discount chain. The mirror over the sink was $40 at Home Goods. The light fixture is from Lowe's. The shower tile was left over from the last house that I renovated...I'm pretty sure I have enough left over to do one more shower stall! The shower door and sink faucet came from Home Depot. Wall paint is Benjamin Moore's Quiet Moments. The only thing that I'd have done differently in this room is pick a different vanity and added a built-in under the cute little window for additional storage space. 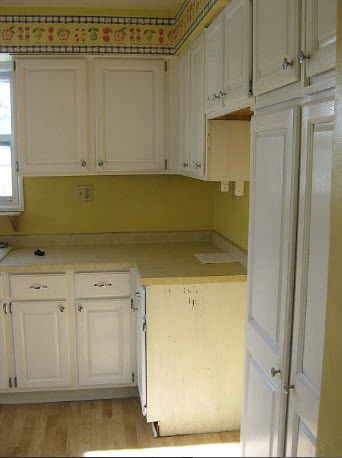 The old kitchen was gross. 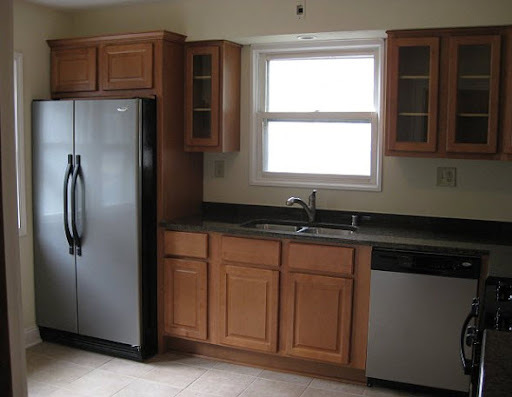 Laminate cabinets full of mouse poop, bad wallpaper border, fake hardwood flooring butting right up to original wood floor. Bad all the way around, it all had to go. By this time, I'd made the decision that the house was going to be sold, so I tried to set aside my personal preferences to choose finishes that would appeal to the broadest range of buyers. I purchased my cabinets in a pretty traditional mid-tone maple at a local discount chain for less than 2k. Appliances from Lowe's and the granite from a local company that I've worked on commercial projects. 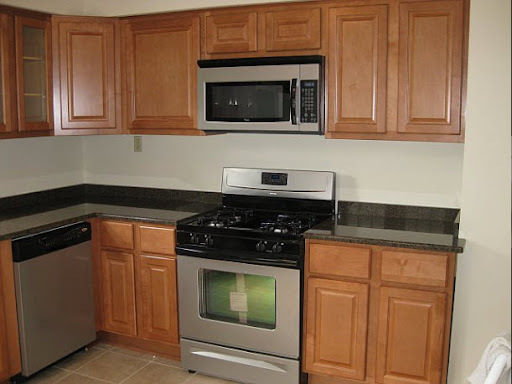 Certainly not my dream kitchen, but for right around 10k including installation labor, I was able to get new cabinets, tile flooring, granite tops, and brand new appliances. I really can't complain about that! All that being said, I'd have done things totally different had I known that I was going to be staying in the house! Didn't Erin do a great job? 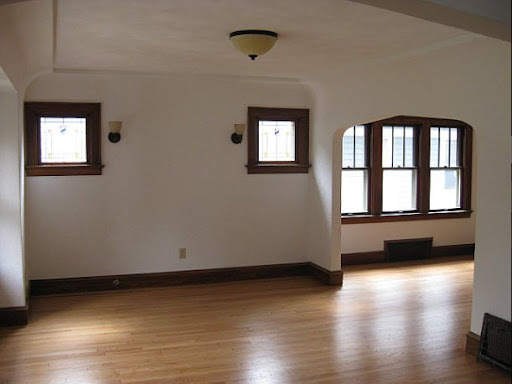 I just about died when I saw the living and dining rooms especially, those windows! The built-in cabinet! The baseboards! While the kitchen is not what she would've chosen for herself, she did an admirable renovation for a grand total of 10k. 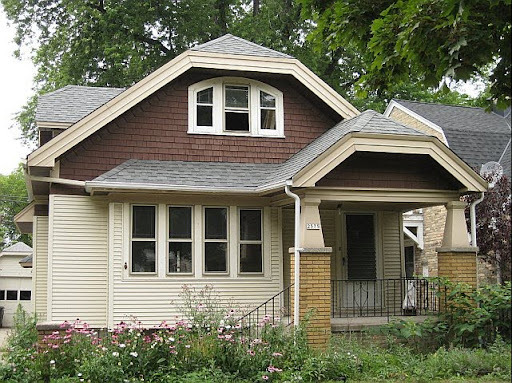 The Milwaukee area has so many wonderful old homes, thank you so much for sharing, Erin! This also brings up a good talking point. 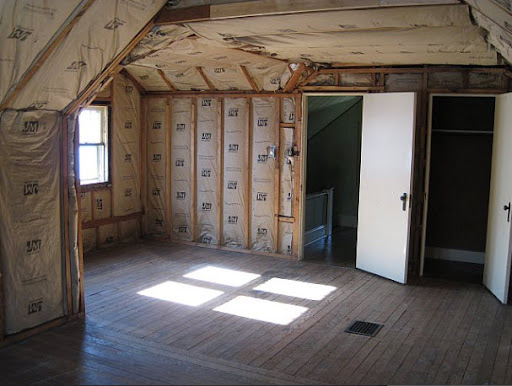 How do you decide what materials to use when you are renovating your home? Do you take into consideration resale value, or just go with what you like? Does it even matter these days with styles changing so quickly? What a beautiful home, to begin with! So much character and charm! Looks great! I'm impressed with the pine floors upstairs. I guess when doing my home, I think of both aspects- what I like, and what everyone else likes. Also, what's worth it to splurge on considering the neighborhood. Although it's pretty easy for me, as pretty much ANYTHING I do to my old house is an improvement! Fantastic! What a charming home! oh my gosh. i am in serious envy of your gorgeous home. you have made some INCREDIBLE changes. regarding your question, i would definitely take into consideration resale value. with the crappy market that doesn't look like it'll bounce back overnight, i think you have to do whatever it takes to appeal to as many potential buyers out there. (unless you plan to stay there for quite a few years). I want a bungalow! I just love old architecture. If I were a Wisconsinite, I would have been fighting tooth and nail for that home! What a great transformation. I love old homes and bungalows are tops on that list. I love that she mixed old and new together. The built-in in the dining room literally made me sigh like I was head over heels in love - because I was. SO pretty! I also love seeing people take the time to rebuild/fix and renovate these older homes. All the history and the character is so important to be preserved for future generations to enjoy and oogle over!!! Wow - she did a fabulous job. She really brought the house back to life. As to your question, I look to both. I try to do something that I like, but will also adds resale value. My 1930s home needs so much though, that any improvement is better than what was there before. Great house ... great makeover. Love all the original features. When I make changes, especially knowing I will probably only be here another 3-5 years, they are mostly cosmetic. All the basics kitchen/bathrooms/furnace, etc had been updated before I moved in so I don't have to do anything major. Anything that might be a personal preference I try to keep in my furniture and decoration, so it can be moved with me and not limit the pool of buyers. What a lovely home. I'm usually a paint everything white person (as you may know), but she was smart not to. In our house, we looked mostly at at things that fit my style, on a budget. We didn't want to be priced out of the neighborhood if we did sell, so I guess we thought about resale. 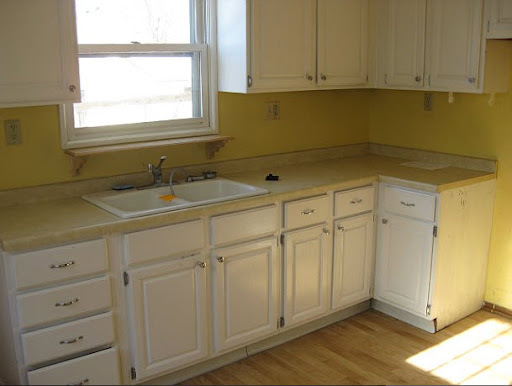 I would have loved granite countertops, but my hubby rightfully questioned it. I'm glad he did. When we bought the house, it was the worst in the hood, so we had a ways to go. I choose materials based on design, price, and durability. Generally, in that order. I think buyers are primarily looking for well designed homes, rather than the banal neutral choices usually picked for re-sale value. 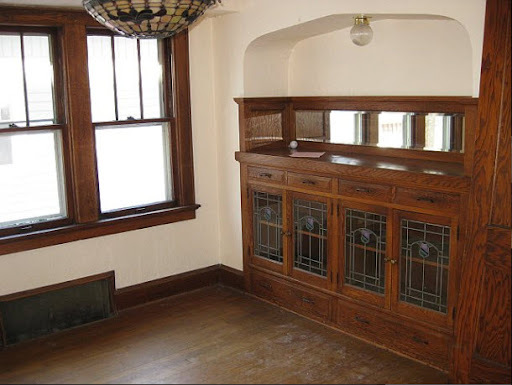 I just love the woodwork and built-ins from old homes. They did a great job keeping the details but sprucing it up. What a great reno...thanks for sharing! When we pick out things for our current house it is mostly because of our taste because we are going to be here for awhile and honestly I know I am going to want to change it again anyway. But at our old house we did everything in consideration of resale because we knew we would be moving in a couple of years. Do you think it is hilarious that I thought all along that it was Russet Street Reno (Nevada) instead of Reno (vation)??? I just got that. And I have a master's degree from MIT!! OMG! Great reno and fun to see! The brick painted on the exterior sure made a huge difference! Thanks for all the prositive comments! Overall I think the project was a success. In a declining real estate market where sale prices (at least in our area) are averaging 20% below assessments, my house sold in a little over three weeks for over asking and 20% over assessed. My next project is trying to figure out how to incorporate some of the things I really love about old houses into the new house we're building. Btw, Kim - I'm usually all about painting everything wood white, so this was tough! The unpainted wood work is such a selling point that I knew I couldn't do it. Wow! Great job! My hubby and I actually flipped our first house, and these before pics pretty much brought me back to that time! I think I will have to write some posts about it now! You guys have done AMAZING work, my friends! I don't think people turly know how exhausting home reno is until they've done themselves (I know we didn't!). I am so impressed! We just went with what we liked since we didn't consider our house a fix n flip. Besides even if we had picked what we thought would appeal to others, I'm sure they would have changed it anyway. Making a house a home is so personal!